I recently picked up some fabulous books on graphic design. They are: The Non-Designer’s InDesign Book, The Non-Designer’s Photoshop Book, and The Non-Designer’s Illustrator Book. What I like about them is that they explain the basics of each program and really act as a springboard for any person looking to get into graphic design. These three books are written by Robin Williams. Born in California in the 50s, Robin was a free spirit: she traveled Europe and hitchhiked across the country. A friend introduced her to graphic design during her time at Santa Rosa Community College. Robin’s books are very user-friendly, and I can tell that she really enjoys writing and teaching graphic design. If you are interested in wanting to know more about how to use these programs, I suggest that you pick up some of her books. I think that Robin’s passion for teaching us about graphic design really puts her at the forefront of the graphic design world. You can pick up Robin’s books at Peach Pit Press. This week’s linage love will pay homage to the female geek. It’s been a while since I have looked outside of my own geekery and seen what other geeks are talking about. I am specifically interested this week at looking for blogs or sites that concentrate on talking about geek culture through the lens of a feminist blogger because it more often will allow for an interesting reflection of the stuff that I like (Sci-Fi, fantasy, comics, and computers) and how gender plays out in each arena. You don’t often find the “average” geek blog or site making the space for gender reflection. You probably already knew that Ripley in Ridley Scott’s Alien was written originally as a man’s part, but did you know that so was Dory in Finding Nemo, Spock in Star Trek, and Luke in Star Wars? What was so interesting about this list was how strong each of these characters were written when they were created for men or without gender stereotyping. This kickstarter project by Debbie Sterling was created to get little girls interested in engineering. She tells us in her video that only 11% of engineers are women, and that toys such as legos and erector sets lay the groundwork for the way you need to think as an engineer. While the disappointing “pink = girls” concept is still at play here, I did find myself considering whether makings something pink might make it more attractive for larger number of parents, which in the end, still serves the purpose of exposing little girls to these challenging new concepts. This is another link I found off of The Mary Sue site. While I was really impressed with this dad’s commitment to his daughter having the experience of “being a hero in the game,” I was also stuck by the reflection of the author about what it means to be a ‘good dad’ and how much lower the bar is for people to be impressed. It’s interesting to reflect on how much society just expects from women as mothers, and gives major props to fathers for doing the same thing. Despite that, I do think this is a pretty awesome thing to do for your kid! While I only highlighted one post from the actual site, I really do recommend checking out The Mary Sue. You can check out posts about the new Hobbit film, Game of Thrones comedy, Fashionably geek designs such as princess Leia spinning at the Mos Eisley cantina, and much more! Here are two ways to indulge this holiday season. Printstagram.com :: Mini-books are $12 for two 50 photo books. Also really neat rip-off-the-day calendars, and sticker books for $10 with 252 stickers. Make a bracelet from your shots on Etsy. Instagram magnets. From StickyGram.com. Each StickyGram is 50mm x 50mm. That’s approximately the same size as they appear on your iPhone. They come in packs of 9. Blow your pics up and turn them into a work of art – on canvas. Make calendars via apps called Calendagram or Keepsy. Instagram ornament. (Notice they make ornaments from other social media icons as well). 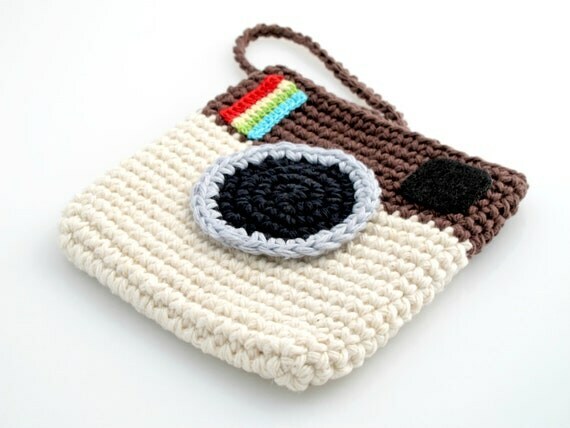 Crocheted Instagram Mini Bag. Purse. Pouch. OR a case for your sunglasses here. Either way, have fun taking photos with the changing of the season and all the fun times ahead of you during the Holidays. I have a thing about the “what’s on your homescreen?” genre of blog posts / websites. I love to scroll through galleries to see what other folks put on their homescreens as the apps you choose to highlight on that precious phone real estate says something to me about the kind of person you are. I can happily waste tons of time looking at posts / sites featuring homescreens (click here, here, and here for just a few examples). Recently I realized that we here at SAWTT had never done such a post, so here it is. Below is a screen shot of my homescreen with some explanation for why those apps are there. Row #1: App Store, Settings, Music folder, Safari. A lot of folks don’t put stock Apple apps like the App Store and Settings on the homescreen, but I like to have them there for easy access — especially since I’ve upgraded to the iPhone 5 and have become obsessed with battery life and find myself opening the Settings app multiple times per day to tweak settings in an attempt to squeeze out as much battery life as possible. The Music folder contains iTunes, the Music app, Pandora, and Podcasts — and Safari is another app I use multiple times per day. Row #2: Messages, Maps, Cameras folder, Photography folder. One surprising development for me since getting an iPhone a couple of years ago is what a huge texter I have become. As someone who previously scorned the form, this is truly surprising. I have also developed digital hoarding tendencies — a recent need to restore my phone as new (thank you, battery issues) prompted a search for an app that would backup my texts (see this post for more on that process) and revealed that I had accumulated over 6,300 texts on my old phone is just two years. So, the Messages app definitely gets a prominent place on my phone. Maps, Cameras and Photography are also used frequently (and again, the over 2,500 photos on my device tells you something about my ability to hoard. I really need to work on that….). Row #3: Facebook, Messenger, Tweetbot, Foursquare. This is the “social” row and these four apps are accessed many, many times per day. I’ve written enough both here and on my blog for readers to know how I feel about social media, so I see no need to elaborate. The surprise would be if these apps weren’t on my homescreen. Row #4: Day One, Clear, 30/30, Drafts. The productivity row — Day One is a great journaling app that helps me keep track of both personal and professional highlights. Drafts is an awesome note-taking app that can send your text just about anywhere (to-do apps, note-taking apps like Simplenote, email, Day One, etc.). And Clear and 30/30 are the task management / to-do list apps that have stuck with me through my experiments with any number of such apps (see this post for an explanation of why I still prefer pen and paper for task management). Row #5: Dropbox, Reeder, Pocket, Cue. Dropbox allows me instant access to any file I need on the go (and has in fact saved me by allowing me to email/text links to files I forgot to send to someone before hitting the road. With Dropbox, I can send the link from wherever I am). Reeder keeps me up to date on the (too many) blogs I subscribe to (again with that hoarding thing), while Pocket lets me save things to read later (and syncs with my iPad and MacBook so I can catch up anywhere). Cue is a recent discovery for me and an app I’m coming to like quite a bit — it pulls information from your calendars, contacts, social networks, etc. to provide an overview of your day. If you’re running late, you can text from within the app to let folks know that — you can also pull up a history of your interactions with the meeting attendees as well as get a weather summary for the day, including sunrise and sunset times. I’m still exploring it, but so far finding it quite handy. Dock: Mail, Phone, Contacts, Calendar. These apps are the reason I have a phone in the first place, so it only makes sense to have them in the row that’s accessible from all screens. Background: The background photo is a picture of a sunset in Ephraim, WI, taken in summer 2012. My husband and I have been vacationing there for the past three years and photos of water and sunsets grace most of my devices as backgrounds. What about you? What’s on your homescreen? Why? Please share in the comments! October and November brought a ton of learning opportunities my way as far as integrating technology into my daily use, as well as learning about the future of Student Affairs. I attended two conferences: #NASPATech and NASPA Region 1, and gained a lot of take-aways, not only for my institution, but for my own personal knowledge. At the end of October was #NASPATech. I learned so much about technology that will play a big role in student affairs, and had a really great time teaching others about Social Media. Now, I heard about the MOOCs revolution, but I never really fully understood what that meant for practitioners until I attended a session facilitated by NASPA President, Kevin Kruger ( @NASPAPres). It was a great session, particularly because it was Kevin who asked the questions that made us all think about the role technology plays in student affairs. One of my favorite topics was on MOOCs: Massive Open Online Courses. I never really thought much about the role that MOOCs would possibly have on my role in residence life and that was because I didn’t think that MOOCs would have an effect on my role. But Kevin challenged us to think about what effect this would have on our positions. In residence life, I think that MOOCs would revisit the purpose of Living and Learning Communities. If (actually… when) MOOCs are prominent in higher education, I think the implication for students who live in our residence halls will significantly change. For sure I think we will have to change our programming styles. As far as how faculty play a purposeful role in a living and learning community, that will have to be examined and see if their role is necessary. Also, in thinking about our roles as practitioners, how would our roles change? I think we should start with understanding why we need to start figuring this out and then to also understand the needs of these students who are enrolled in MOOCs. 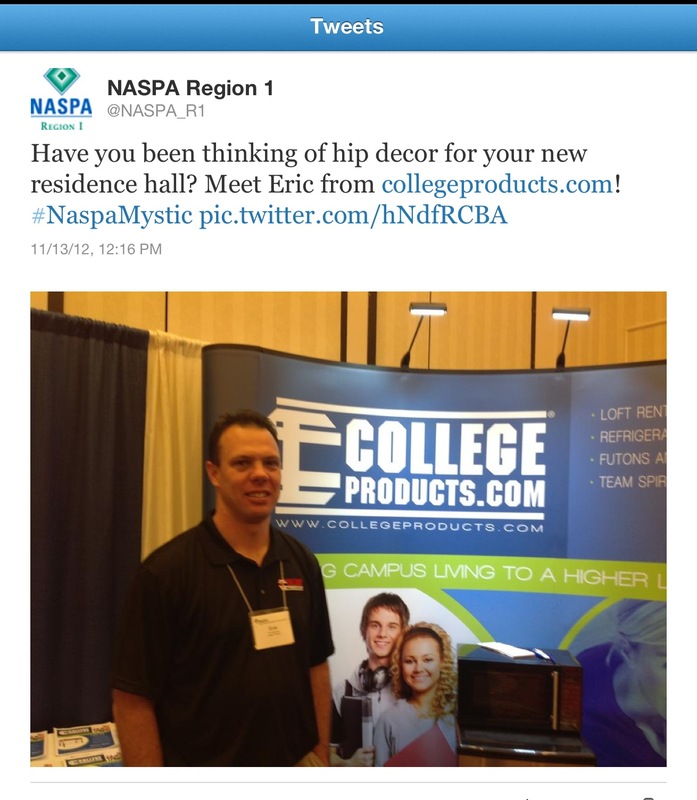 In November, I attended NASPA Region 1 (#NASPAMystic) and not only did I have the opportunity to present twice on social media and personal learning networks, I was also able to use social media (mainly Twitter) in a new way with vendors and corporate sponsors. At most conferences I’ve been to, the exhibit area doesn’t get as much love as it should get. Have your social media people do something similar. After I spoke with Eric, I just tweeted out something about the product and used the conference hashtag, so that conference attendees would know where to find him. We didn’t have booth numbers, but I would also suggest to put that in a tweet. It’s a really easy way to draw more action to your exhibit hall and help make your vendors feel a little more loved. I think my biggest take-away from October/November is the connection that I made with the many professionals IRL and F2F. There is something to be said about Twitter being the tool you use for the people with whom you would want to connect and Facebook being for the friends you already have. I was lucky enough to meet a lot of people and to teach and learn from one another. While using social media is great to connect with people, nothing beats meeting colleagues in real life. I just got officially engaged this weekend. I am so excited about the person I will be sharing my life with that I feel spoiled with love. Beautiful ring, wonderful partner, friends and family who are happy for us – everything should be perfect right? Well, it turns out that I am quite the reluctant bride to be. At the beginning of our discussion about getting married, I started to pin ideas on Pinterest, but felt it necessary to pin 4-5 geeky items each time to “cover up” my wedding posts. This weekend it took quite a lot of encouragement to post pictures of my engagement ring online. I have come to realize that I have a “feminist bridentity crisis.” As soon as I became part of an engaged couple I began to be peppered with questions that made me question what is important to me and what is not. Ultimately in thinking about my answers, I am wondering what it means to be a strong feminist woman planning a wedding. Do I take my partner’s name? Do I have my father give me away? What role do I have in planning the wedding and what role does my groom play? While I struggle with these questions, I also continue to process my feeling about my feelings. It turns out that I actually like looking at wedding magazines, pinning wedding dresses and decorations. Does that mean that I am buying into the wedding industrial complex, and is that okay? I also marvel that my partner, who is totally comfortable in his excitement for the wedding. While he does not feel like his identity as a feminist man is at risk because he is willing to adopt many wedding traditions, he honors the fact that I am struggling with it, and has the patience to talk through my endless philosophizing. Together we have started to read a book called Offbeat Bride by Ariel Stallings, the story of the woman who started her own website/blog about planning a wonderfully unique wedding that bucks tradition. This website’s blog posts give language to a lot of what I have been feeling. I do take a comfort in the fact that we don’t fit the hetero-normative and traditional patterns of engagement. My partner is a trans man who loves that I scooped him by unofficially proposing with a paper ring before he proposed to me with a beautiful blue sapphire that I helped pick out. He is an event planner for Gay and Lesbian Advocates and Defenders (GLAD) and is taking on the large majority the logistics (he already has the photographer, caterer and venue almost booked – yes, it’s been just 3 days!). I am taking care of all the design details, including the wedding website, invitations, infographics (maybe? ), and the geeky details, including phone apps and social media. We both feel we’ve gotten the better part of the deal – it’s really quite perfect. We’ve talked about the fact that all of his side of the wedding party will be women, and at least one or two of mine will be men. We love that we get to plan something that is about us, and celebrating every aspects of our uniqueness. While I am still coming to terms with my bride-to-be status, I am appreciating that I am not alone in this storm of feelings. It helps to hear others who have come up against these same questions and how they sorted everything out. I hope you will comment and share your own stories. Did you, or do you expect to have a feminist bridentity crisis too? How often do you find yourself having conversations with friends or colleagues about how to make life easier at work? It seems that many of us (and this is not just a Student Affairs problem, I should say) take on too much at work, and have a hard time prioritizing what needs to get done by when. Many of us complain about wanting to find balance at work while still managing to make it home to have some semblance of a life outside work. I don’t profess to have this completely figured out, I just want to offer some tips that have worked for me. Please feel free to add your thoughts in the comments. Learn to delegate: One of the greatest lessons I have learned as a professional has been the art of delegation. Know what needs to be done by you, and what just needs to get done. As a perfectionist, it was hard for me to delegate things to others when I knew they couldn’t do it the way I would do it. After going through a period where I was doing 2-3 jobs, I quickly learned that as long as the task got done, that was far more important than getting it done exactly my way. Schedule your lunch: About a year ago, I made a reoccurring appointment on my calendar from noon-one for lunch. I did this because: a). I was tired of people seeing this as a free period for meetings, and b). I needed some time to just eat and be at peace. I frequently eat lunch in my office during this hour, but I close the door, eat, and try to take some time to get my mind off work. Other people in my office use this time to get to the gym for a bit, or take a long walk. What a great way to recharge for the second half of the day! Examine your work environment: Does your work space “fit” you? We spend 8+ hours a day in these places, if you aren’t comfortable in it, can you be as productive as needed? Make sure your office space represents you: bring in pictures from home, inspirational cards, even an accent wall color (ask your supervisor first). Also, it’s important to make sure the ergonomics of your desk and chair work for you. If you are not physically comfortable in your work space, how can you be productive? Make to-do lists: Not everyone is a to-do list person, but if you are, keep your list updated and be sure to cross things off when you complete them! If you are looking for a good application to use for your to-do list, I recommend WorkFlowy. I hope this list helps you out, or gets you to think about how to improve your work life so you can be your most productive self. If you have any tips to add, please share them in the comments.